Enjoy an array of happy springtime events from 13th-30th March as part of the Falmouth Spring Festival in Cornwall, perfect for a pre-Easter getaway. The festival celebrates Falmouth’s open and green spaces through music, dance, community activities, sport and art. 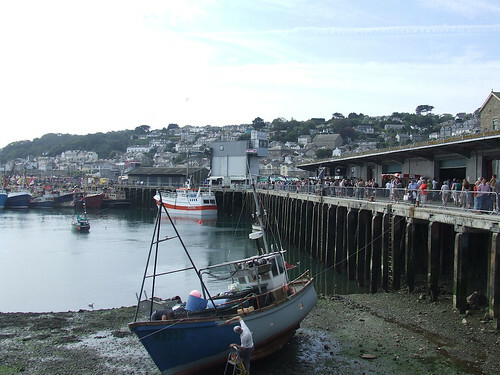 A large town, port and resort beside one of the world’s most beautiful natural harbours, Falmouth is a brilliant place to visit for beaches, sailing and sightseeing. 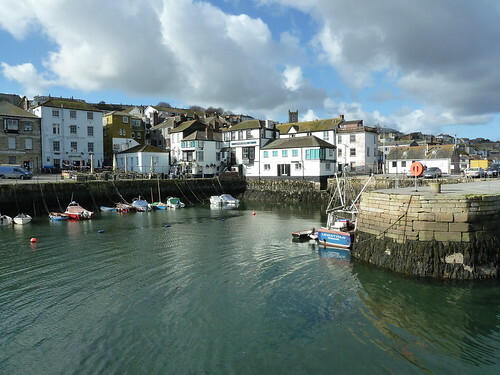 On the 13th, pupils from local schools, together with students from Falmouth University, will paint the town yellow with displays of daffodils and decorations in over 100 shop windows. Saturday 22nd and Sunday 23rd March is a free games event called Mar Games on the Moor. From 10am to 4pm, you and the family can enjoy dodging a swing ball, playing giant snakes and ladders, connect 4 or quiots. Also on that weekend is the Mar Cider and Folk Fayre, with a great range of bands and a choice of over 20 scrumptious ciders from across the West Country. Events Square will also host a marquee full of food and craft stalls and children’s activities from 10am until late. Throughout the festival there will also be lots of different guided walks covering topics such as foraging for food, astronomy, nordic walking, beach-combing, wildlife and history. Different grades and duration mean there will be something for everybody! For more information on these and the many other activities taking place, visit the website. Sitting on the edge of Falmouth and only a five minute walk to Swanpool beach and seven minutes to the beautiful Gyllingvase beach by cliff and coastal paths is this lovely private apartment on the first floor of a private house. The comfortable accommodation offers a terraced garden (with table/chairs, loungers and gas barbecue) and 180 degree views across to Swanpool and Falmouth Bays. There are two bedrooms (one double, one twin), a living/dining room, fitted gallery kitchen and bathroom (suite plus bath-shower). The friendly owners live unobtrusively in the main house and are delighted to offer advice on days out etc if requested. It’s nearing the end of November, the nights are getting bitingly cold and thoughts of Christmas are starting to creep in. So, what better way to start the festive build up than with a hot cup of mulled wine, some cheese or tasty fudge at one of the many Christmas markets setting up in towns across the country! 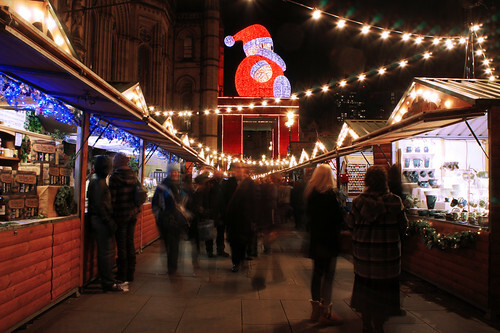 Manchester opened its international markets last weekend, with a two-floor bar and an enormous glowing Santa in Albert Square. Opening this Thursday (21st November) are the West Country Christmas markets. The Cathedral Green in Exeter will be filled with over 50 local and international traders offering a variety of foods, drinks and handmade crafts, perfect for presents. Take a picturesque train journey from this semi-detached cottage (sleeps 5) situated by the waters edge with views across the bay. This weekend on the 23rd and 24th November you’ll find a great selection of food, drink and crafts at the Food and Craft Fair in St Austell. Positioned on the site of the old china clay works at Wheal Martyn, enjoy some relaxed, hassle free shopping at this historic site. Take your treats back to the sauna at this upside down house in Talland Bay (sleeps 6). From 27th November to 1st December Truro will host the Made in Cornwall Fair on the Lemon Quay. There will be a great range of Cornish products, from award-winning food produce to unique clothing to collectable teddy bears. Also on the Lemon Quay on 4th December will be the Primestock Show when town meets country and you can get up close to Cornwall’s finest livestock. And finally, Santa will be arriving by boat in the picturesque, seaside town of Fowey on 29th November to lead a lantern procession through the village. After which, there will be two days of entertainment, food and drink. Stroll back to this elegant Victorian house (sleeps 7) with views across the river. Yesterday we drove from Manchester to Durham to see the light spectacular that is Durham Lumiere festival, probably one of the most prominent light festivals currently in the UK. Its popularity showed, as thousands upon thousands of people were walking around Durham’s streets in search of the series of light-based art installations spread across the city. We did not have reserved tickets for the central portion of the trail, so had to explore the outer pieces first. This worked out well as there seemed to be many queues for the central part, and had we started there first we might not have had time to go around the outer pieces. Favourite pieces on the outer part were ‘Keyframes’ by Groupe Laps, a large collection of illuminated stickmen climbing the former Durham Miners’ Hall. Platonic Spin by Nathaniel Rackowe was a lovely patterned light sculpture going through sequences which drew out the space into lines and rectangles floating in the gardens. The long wait to get in to the central part of the festival was worth it however, particularly for the illusory ‘[M]ondes’ by Atsara at the Cathedral Nave and The College. Lights like fireflies flitted across the gardens in a beautiful dance and hypnotic concentric circles and other projections formed the space into something quiet but magical. Well worth a visit, but be prepared for crowds as the festival will only grow in popularity! Starting tonight and running each evening until Sunday is the incredible Lumiere Festival in Durham. One of the UK’s largest and most spectacular light festivals of the year, Lumiere promises to be every bit as exciting as previous years, and what’s more, it’s free to attend! There will be some of the most innovative uses of lighting technology, from the most complex 3D projections in the form of a huge Elephant walking through the urban environment; and Crown of Light, video-mapping at its best on the cathedral; to simple technologies such as Litre of Light, which uses old plastic bottles and refracted sunlight to create a solar bulb bright enough to light up a home. There will also be all manner of neon delights, stained glass cars, ghostly lit up dresses and musical tents. Perhaps one of the most impressive installations of the festival will be Solar Equation, an impressive simulation of the sun hung over the Durham University Science Site which will feature projections generated by live mathematical equations that simulate the turbulence, flares and sunspots that can be seen on the surface of the sun. This year there are free tickets to the central part of the festival up until 7.30pm. This is to ensure that it does not get too crowded in the most popular areas at the busiest visiting time. Unfortunately all tickets have been reserved, however there are plenty of artworks outside of the central zone to visit before being allowed in without a ticket after 7.30pm. I went along in 2011 and had a brilliant time. I wrote up my experience and pictures on my personal blog, which you can view here. I intend to go again this year and will report back for those of you unable to make it! However, if you are able to get to Durham this weekend, I certainly recommend you go.